After your Client has your approved your business proposal along with the terms and conditions, specified in your quote, it is time to forward the process to the next workflow stage – the creation of the Job. The Job would activate several important features, including the Calendar scheduling, the Staff alocation, as well as the Invoicing. Bear in mind that at this stage you still can add or remove items and services to the initial list of activities offered in the Quote as well as edit the Scope of work and the Job picklist. 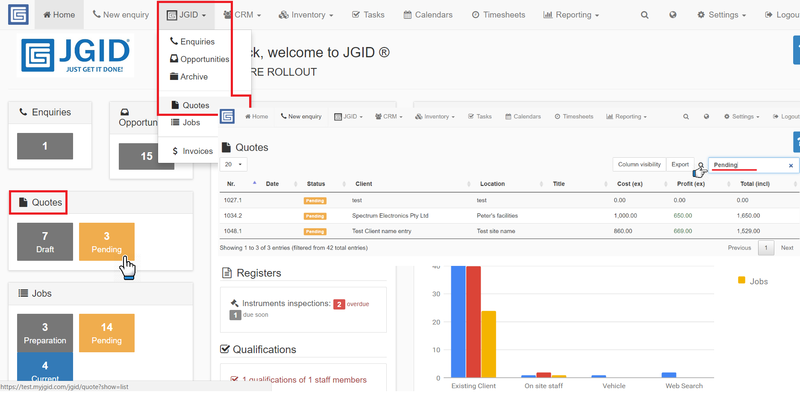 JGID is pretty flexible in regards to editing the initial Quote’s content which would allow you to manage and adapt to the variations of the particular project. 1. Go to the list of Pending Quotes (either accessing through the highlighted in orange tab under the Quotes Section on the dashboard or from the JGID tab onto the taskbar selecting Quotes and typing “Pending” into the search bar of the newly opened window) and select the Quote you have received notification of approval for. 3. Tick the checkbox confirming that the current user, reviewing the quote confirms it has been approved. If you have Customer Reference number you can type it in the relevant section. JGID allows you to add any extra details in the form of document files and pictures (for example the signed copy of the quote sent to your notification e-mail).